The effects of a tsunami on a coastline can range from unnoticeable to devastating. The effects of a tsunami depend on the characteristics of the seismic event that generated the tsunami, the distance from its point of origin, its size (magnitude) and, at last, the configuration of the bathymetry (that is the depth of water in oceans) along the coast that the tsunami is approaching. Small tsunamis, non-destructive and undetectable without specialized equipment, happen almost every day as a result of minor earthquakes and other events. They are very often too far away from land or they are too small to have any effect when they hit the shore. When a small tsunami comes to the shoreline it is often seen as a strong and fast-moving tide. Tsunamis have long periods and can overcome obstacles such as gulfs, bays and islands. These tsunamis make landfall usually in the form of suddenly decreasing and then rapidly increasing water levels (not unlike a tidal bore) a combination of several large waves or bore-type waves. Generally tsunamis arrive, not as giant breaking waves, but as a forceful rapid increase in water levels that results in violent flooding. However, when tsunami waves become extremely large in height, they savagely attack coastlines, causing devastating property damage and loss of life. A small wave only 30 centimetres high in the deep ocean may grow into a monster wave 30m high as it sweeps over the shore. The effects can be further amplified where a bay, harbour, or lagoon funnels the waves as they move inland. Large tsunamis have been known to rise to over 100 feet! 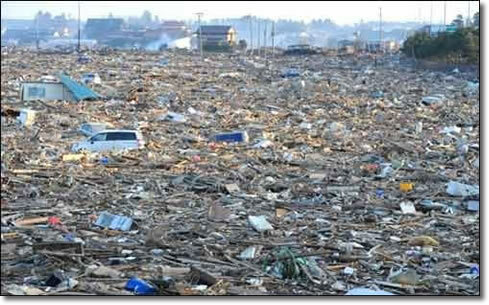 The amount of energy and water contained in a huge tsunami can cause extreme destruction when it strikes land. The initial wave of a huge tsunami is extremely tall; however, most damage is not sustained by this wave. Most of the damage is caused by the huge mass of water behind the initial wave front, as the height of the sea keeps rising fast and floods powerfully into the coastal area. It is the power behind the waves, the endless rushing water that causes devastation and loss of life. When the giant breaking waves of a tsunami batter the shoreline, they can destroy everything in their path. Destruction is caused by two mechanisms: the smashing force of a wall of water traveling at high speed, and the destructive power of a large volume of water draining off the land and carrying all with it, even if the wave did not look large. Objects and buildings are destroyed by the sheer weight of the water, often reduced to skeletal foundations and exposed bedrock. Large objects such as ships and boulders can be carried several miles inland before the tsunami subsides. Tsunami waves destroy boats, buildings, bridges, cars, trees, telephone lines, power lines - and just about anything else in their way. Once the tsunami waves have knocked down infrastructure on the shore they may continue to travel for several miles inland, sweeping away more trees, buildings, cars and other man made equipment. Small islands hit by a tsunami are left unrecognizable. Especially along a high seismic area, known as the Ring of Fire, tsunamis may have dramatic consequences as they hit less developed countries. The buildings infrastructure in these poorer nations are not well built and cannot withstand the impact of the tsunami. Whole areas and towns are a picture of destruction as the tsunami leaves at trail devastation and misery behind it. One of the biggest and worst effects of a tsunami is the cost to human life because unfortunately escaping a tsunami is nearly impossible. Hundreds and thousands of people are killed by tsunamis. Since 1850 alone, tsunamis have been responsible for the loss of more than 430,000 lives. There is very little warning before a tsunamis hits land. As the water rushes toward land, it leaves very little time to map an escape plan. People living in coastal regions, towns and villages have no time to escape. The violent force of the tsunami results in instant death, most commonly by drowning. Buildings collapsing, electrocution, and explosions from gas, damaged tanks and floating debris are another cause of death. The tsunami of December 2004 that struck South East Asia and East Africa killed over 31,000 people in Sri Lanka only, leaving 23,000 injured. Tsunami waves and the receding water are very destructive to structures in the run-up zone. The areas close to the coast are flooded with sea water, damaging the infrastructure such as sewage and fresh water supplies for drinking. Flooding and contamination of drinking water can cause disease to spread in the tsunami hit areas. Illnesses such as malaria arise when water is stagnant and contaminated. Under these conditions it is difficult for people to stay healthy and for diseases to be treated, so infections and illnesses can spread very quickly, causing more death. 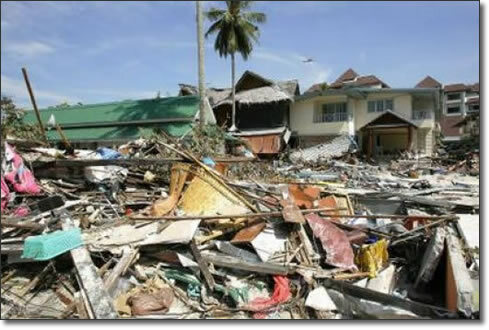 Tsunamis not only destroy human life, but have a devastating effect on insects, animals, plants, and natural resources. A tsunami changes the landscape. It uproots trees and plants and destroys animal habitats such as nesting sites for birds. Land animals are killed by drowning and sea animals are killed by pollution if dangerous chemicals are washed away into the sea, thus poisoning the marine life. The impact of a tsunami on the environment relates not only to the landscape and animal life, but also to the man-made aspects of the environment. Solid waste and disaster debris are the most critical environmental problem faced by a tsunami-hit country. Recycling and disposal of this waste in an environmentally sensitive manner where possible (crushing concrete, bricks, etc. to produce aggregate for rebuilding and road reconstruction) are critical. Combined with the issue of waste is that of hazardous materials and toxic substances that can be inadvertently mixed up with ordinary debris. These include asbestos, oil fuel, and other industrial raw materials and chemicals. Rapid clean-up of affected areas can result in inappropriate disposal methods, including air burning and open dumping, leading to secondary impacts on the environment. Contamination of soil and water is the second key environmental impact of a tsunami. Salination of water bodies such as rivers, wells, inland lakes, and groundwater aquifers can occur in most cases. This also affects the soil fertility of agricultural lands, due to salination and debris contamination, which will affect yields in the medium and long term. Sewage, septic tanks and toilets are damaged contaminating the water supply. Last but not least, there may be radiation resulting from damage to nuclear plants, as it happened in Japan in March 2011. Since radiation exists for a long time, it has the capacity to inflict damage upon anything exposed to it. Radiation is most dangerous to animals and humans causing destruction as molecules loose their electrons. The damage caused by radiation to the DNA structure determines birth defects, cancers even death. Massive costs hit communities and nations when a tsunami happens. 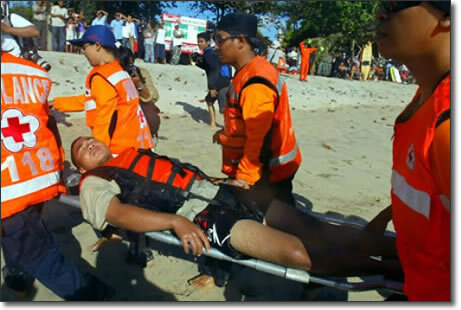 Victims and survivors of the tsunami need immediate help from rescue teams. Governments around the world may help with the cost of bringing aid to devastated areas. National institutions, the United Nations, other international organizations, community groups and NGOs , and a variety of other entities come together to provide different kinds of aid and services. There might also be appeals and donations from people who have seen pictures of the area in the media. Reconstruction and clean up after a tsunami is a huge cost problem. Infrastructure must be replaced, unsafe buildings demolished and rubbish cleared. Loss of income in the local economy and future losses from the destruction of infrastructure will be a problem for some time to come. The total financial cost of the tsunami could be millions or even billions of dollars of damage to coastal structures and habitats. It is difficult to put an exact figure on the monetary cost but the cost may represent an important share of a nation's GDP. Victims of tsunami events often suffer psychological problems which can last for days, years or an entire lifetime. Survivors of the Sri Lankan tsunami of December 2004 were found to have PTSD (post traumatic stress disorder) when examined by the World Health Organization (WHO): 14% to 39% of these were children, 40% of adolescents and 20% of mothers of these adolescents were found to have PTSD 4 months after the tsunami. These people were suffering from grief and depression as their homes, businesses and loved ones were taken from them. Many still had PTSD. Periliya Village counts 2,000 dead and 400 families became homeless. These people were found to still have psychological problems 2 years after the tsunami.